[MATTHEW B. RIDGWAY]. Traditional Korean dish, engraved around the base with four stars, and the inscription, “General & Mrs. M. B. Ridgway / From Defense Minister & Mrs. Ki Poong Lee / Republic of Korea,” ca. 1952. 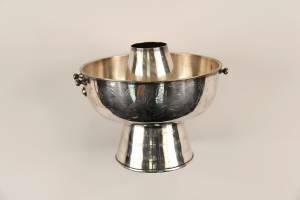 The dish is 6” high and 7” in diameter and fully hallmarked on the bottom. The weight is approximately 24 ounces. The handles and one knob at the top are missing, else, fine. Matthew Bunker Ridgway (1895-1993) led the transition of the 82nd Infantry into the 82nd Airborne in World War. He commanded his division during the invasion of Sicily. Ridgeway helped plan the Allied invasion of Europe, and jumped with his command on D-Day. When North Korea invaded South Korea in June, 1950, the 8th U.S. Army was hit hard. Ridgway assumed command in December, 1950. The Army made a strong foray into North Korea, but was met with an unexpected and overwhelming Communist Chinese advance, and the Americans were in tactical retreat. Ridgway’s decisive leadership quickly improved the morale of the Eighth Army, and the Chinese offensive was slowed and finally brought to a halt. He then led his troops in a counteroffensive in the spring of 1951. When General Douglas MacArthur was relieved of command by President Harry Truman in April 1951, Ridgway was promoted to full general, assuming command of all United Nations forces in Korea.